Gee, this is a huge surprise!!!! Venezuela's Marxist-Leninist president Hugo Chavez wants to be leader for life. BUENOS AIRES, July 23 (RIA Novosti) - Venezuelan president Hugo Chavez has said he will soon submit to parliament a bill allowing the president to be re-elected an unlimited number of times. "If people don't vote for me, I will leave. I'm not trying to hold onto this place, as I have always said. 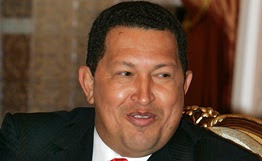 I won't cry if I am rejected," Chavez told the Hello President TV show Sunday. "If the Venezuelan people say go, I will go," he said. Venezuela's leader is elected by a simple majority by a direct national vote and is the head of state and government for six years, and can be re-elected once. "I think the country's Constitution should be changed. This first of all concerns presidential terms. We have no right to deprive people of the possibility of electing a leader they like for a fourth, fifth or sixth term," he said. Earlier, Venezuela's parliament gave Chavez wide legislative powers. The new bill makes it possible for Chavez to issue decrees aimed at full nationalization of the country's economy, including the power sector and telecommunications, for 18 months. This is an interesting topic. In America, we have voted for term limits supposedly to keep out career politicians and to keep things fresh. The other side of the argument would be what to do about keeping the good ones in place to continue doing what they have done. In Belarus we have Lukashenko and probably will have him for a long, long time. But the fact remains, and this despite western rhetoric to the contrary, he is the elected leader and not royalty; his continuing to be the president has so far been an indication of the will of the people. Certainly as the demographics and economy changes, so will the situation so there will always be the thought that after five years we might need to go to a different guy. So far this has not been the case but you never know. Hugo Chavez is just the latest in a tragically long line of despotic dictators many of whom have had popular support at the beginning of their reign. Perhaps the most tragic aspect of them all is how similarly they progress toward their usually ignominious ends.Think Mussolini,Hitler,Ceausceau,Amin,Chevalier(Papa Doc)Assorted other Africans,etc,etc. Interestingly the worst,Stalin and Mao Zedong have yet to be thoroughly recognized as at the vanguard of this awful gang,mainly,one suspects because of the largely leftist Western media's dishonesty and inability to acknowledge facts which might derail their cosy marxist theories.This may also explain why this latest darling of the left is being feted by the leftist media,even though those with eyes to see,see only escalating dictatorship,further loss of freedom,political imprisonment,economic collapse and blood. So he wants Venezuela to become less like the USA - where they have term limits - and more like NZ/Aus/UK - where they do not. Clearly the man is a tyrant. Lock him up. "So he wants Venezuela to become less like the USA - where they have term limits - and more like NZ/Aus/UK - where they do not. Clearly the man is a tyrant. Lock him up." Bet you would be upset if the likes of Dubya did that here in the U.S., but hold another standard for Chavez. I wouldn't give a crap if Bush did that. Term limits are a bit stupid in my opinion. If someone is a great leader (no chance of Bush claiming that title) then the people should be allowed to elect them for as long as they want. unfortunately "elections" a la Mugabe or Putin do not.